Politics and popular culture are intertwined with one another. Popular culture is a space where a society's political values are reflected, taught, reinforced--and sometimes challenged. Politics is popular culture through how political agents are represented by various types of popular culture, and how politic institutions and actors often try to censor, control, and use popular culture to advance their own goals. In this new episode of the podcast series here on We Are Respectable Negroes, I had a great time talking about the politics of popular culture as they relate to the classic American comic book character Captain America with Professor Mark D. White. 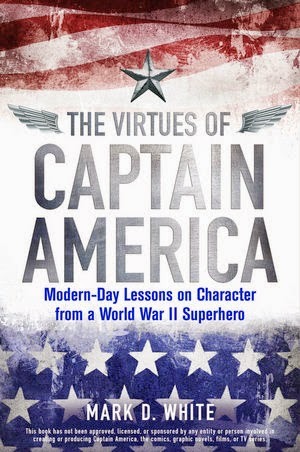 He is the author of the new book The Virtues of Captain America. Mark has also edited and contributed to numerous books on the politics and philosophy of superheroes that include such franchises and characters as Watchmen, Batman, Superman, The Avengers, and Iron Man. Given the recent release of the awesome film Captain America 2: The Winter Soldier on blu-ray and DVD, and how the United States is now in a war against ISIL, the basic questions of civic virtue, responsibility, and the way that superheroes are a mirror for examining America's core values both at home and abroad, makes my conversation with Professor White very timely. Mark White is a fun and engaging conversation partner. In this, the ninth episode, of the second season of WARN's podcast series, we talk about what comic books and superheroes can tell us about philosophy and politics, work through what makes someone "heroic", the ways that the general public often misunderstands and misreads the Captain America character, as well as how American exceptionalism, race, and identity relate to superhero and other types of comic books and graphic novels. Dr. White also offers some practical advice for journeymen students and scholars. 00:00 Introductions, Going to Chicago Comic Con, offering thanks to the friends and fans of WARN and Chauncey DeVega. 04:49 Why does popular culture matter? How do you use popular culture to help students understand philosophy and politics? 09:09 Deciding to enter academia. How did you start thinking and writing about comic books and other types of popular culture in a serious way? 12:30 What comics did you grow up reading? How did you get back into the hobby? 15:23 Translating one's expertise in philosophy to a more "popular voice". 20:52 The Matrix, popular culture, and how regular folks are "doing" philosophy and ethics on a day-to-day basis in their own lives. 23:10 How do we define a superhero? Who decides? What does this definition tell us about a given moment in history, culture, and social life? 29:00 The psyches of superheroes. Is Batman mentally ill? On Superman and responsibility. 32:05 Heroes versus Anti-Heroes. Moral judgement, heroism, and the hard choices that superheroes have to make. 36:00 The many problems with the movie Superman: Man of Steel. 38:00 Superheroes and September 11th. 41:54 Why study and write about Captain America? What can Captain America teach us about politics and ethics today? 46:22 The challenge of writing the Captain American character. How Captain American is very easy for the public to misunderstand and misappropriate. The symbolism of Captain America, race, and American identity. 50:23 Captain America's cosmopolitan patriotism. 54:24 The rules of writing Captain America and other Marvel characters. 61:07 In your opinion, what are the best/favorite Captain America story-lines? 64:55 Random geek moment--writing crossword puzzles for the local newspaper as a child. A new word: cruciverbalism. 68:00 Learning to network and make contacts in academia and other endeavors. 70:14 It is easy to fail if you don't try. 73:20 Where to find The Virtues of Captain America, contact info, upcoming work. 75:14 Chauncey DeVega's closing comments on the rise of superhero films in recent years, the importance of Blade and Unbreakable, his chosen superpower, anti-heroes, trying to kill Santa Claus as a child, and pitching the character "Mediocre Man". This was great. Mark's love of the pure heroics of superheroes has really stuck with me. There really is something inherently fascinating about someone who continually rescues people. I think he was a bit too coy regarding Batman though, haha. Batman definitely has some kind of neurosis. Thanks for the comment. Batman has got some serious issues. I really enjoyed talking with Dr. White. Each season I will have some ghetto nerd goodness to offer up. This was a nice convo to that end. This was great! I finally got around to listening to it. Hate to bug you again, Sister Lauren and myself could use your help. On Eugene Robinsons latest over at truth dig Sister gave me her phone # I talked to her and we think we have a plan. Could you give her a call so that she may fill you in?